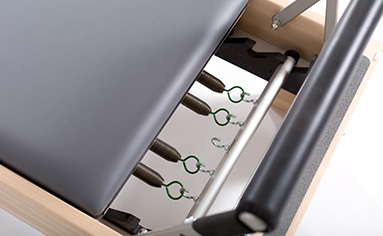 The CenterLine provides a traditional Pilates experience, modern craftsmanship, customer service and on-time delivery. Our collaborators: Amy Taylor Alpers and Rachel Taylor Segel of The Pilates Center in Boulder, CO. 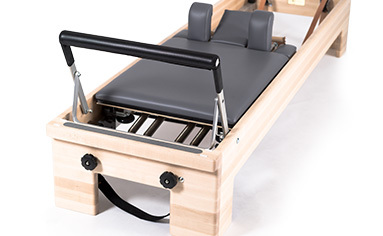 The CenterLine Reformer is deeply rooted in the origins of Pilates, yet with subtle innovations that you and your clients will appreciate. Details make the difference. 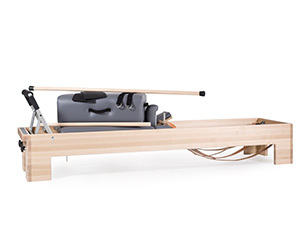 Every touch point on the Reformer is optimized to give you exactly what you need and nothing else. The deliberate resistance, feedback and “end feel” so critical in the traditional experience of carriage ride. A quiet ride, so you and your client can focus on the work, not the noise. Shoulder blocks that are comfortable and stable, with secure support for shoulders, hands and feet. Our process yielded superb optimizations for transitions, safety and ease of use. We put our 40 years of experience to work in developing new springs for this machine. The CenterLine comes with four non-plated, semi-heavy springs. Need your Reformer quickly? How about next day shipping for stock orders? Strata® Rock Maple frame, 14" (36cm) height. Headrest with 3 positions, removable. Jumpboard bracket pre-installed (for optional jumpboard). Strata® Rock Maple, 14" (36cm) height, covered by our Limited Lifetime Warranty. Integrated standing platform, 2" (5cm) with non-skid safety surface. Extra-wide 7" boards combined with fitted and joined frame and legs create an exceptionally sturdy, stable machine. The deliberate resistance, feedback and “end feel” so critical in the classical experience of carriage ride. Carriage: standard foam padding and heavy-duty vinyl upholstery. Choose from 35 colors. Heavy-duty vinyl. Choice of nine standard colors included at no additional cost, or choose a custom upholstery color for an additional $85 per piece of equipment. Try our Color Tool and get more information here, or email us for a sample color palette. Mount pole to frame for easy access. Keep your Reformers steady and in place.